A couple is facing criminal charges after repeatedly calling 911 yesterday to report that possums and people were “jumping out of their refrigerator and microwave,” according to a police report. Brandon Terry, 32, and Casey Fowler, 28, were collared Sunday morning for unlawful use of the police emergency system. 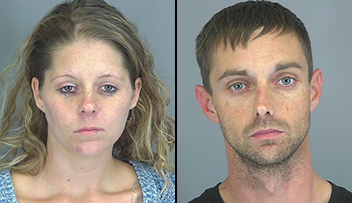 The duo was busted at their rented South Carolina home (where they had just moved to from North Carolina). While both Terry and Fowler denied being under the influence of any narcotics, cops concluded that the couple’s five 911 calls were likely triggered by the synthetic drug “flakka,” which often has hallucinatory effects on a user. In addition to the misuse of 911 charge, Terry has six outstanding felony narcotics warrants in North Carolina.